We love to travel, of course, but we have a dog and we miss her desperately when we are away. So whenever we are traveling by car, I try to bring her along. Traveling with your dog is a little more work than leaving her with a family member, kennel, or petsitter, but the fun we have sharing our adventures with her makes it all worth it. Like me (and probably you! ), our dog, Posey, really loves trips to the beach! 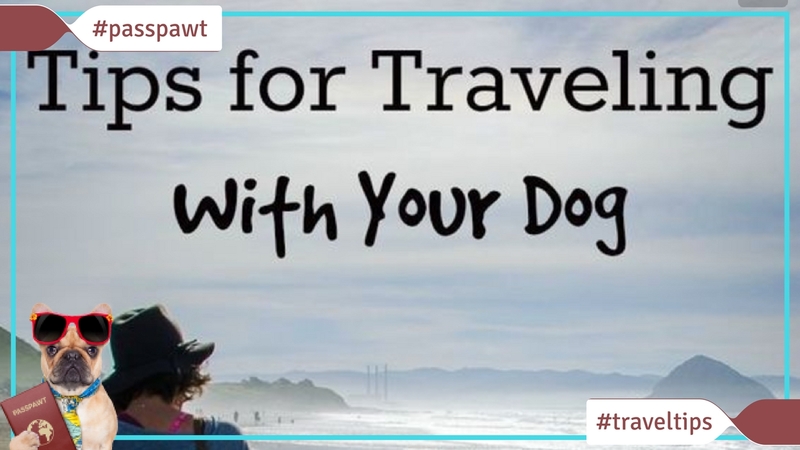 Here are some tips for traveling with your dog or other pet. They mostly apply to domestic travel by car as it’s all I’ve ever done, but most of the tips apply to travel by plane or train. Have any other questions or concerns about traveling with your pet? Leave them below and I’ll try to help you out! First, for your own sanity and the dog’s health and safety, your dog should be comfortable riding in the car, be house trained, and be reasonably well-behaved–not aggressive, overly barky, or likely or chew up things in the hotel room. Dogs with more serious behavior problems should be left home. Make sure your dog is wearing a collar AND is microchipped with updated contact information including your cell phone number. In case the collar gets lost, the microchip can be used to locate you. Make sure the dog is current on all vaccines, especially rabies. Some hotels, kennels/day care facilities, or businesses may ask to see proof of rabies vaccination before they admit your dog. Be sure your dog is current on a monthly regimen of topical flea/tick medication. Even if you don’t see any fleas on your pet you do not want your dog to leave fleas or ticks in a hotel room! Stop frequently for water and potty breaks. Just because you (ahem… Kevin!) can go three hours without stopping to use the restroom, doesn’t mean your dog can. 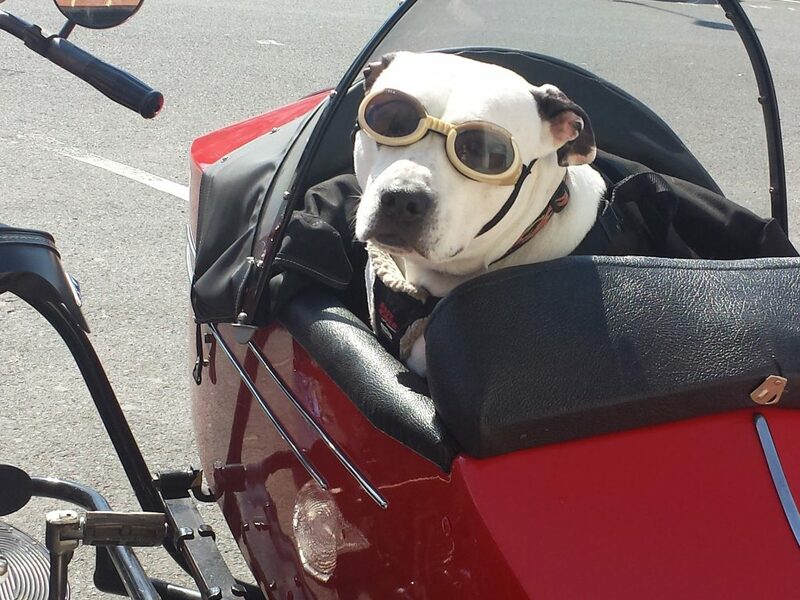 You want to keep your pet comfortable on the road. If you have a crazy, foraging food-hound like we do, do not keep any food in the cabin of the car! On a trip to Mendocino a few months ago, we left an unopened quarter-pound wedge of camembert cheese in the car when we went into a restaurant for lunch. When we returned to the car, we found Posey had devoured it, along with most of the plastic wrapper! Only stay in a hotel or motel that allows pets. Do not try to sneak a dog into a hotel or motel. Most have hefty fines for guests caught abiding by their policies. Research hotels/motels before you leave. If in a pinch, Motel 6 allows pets to stay (for free!) at any of their facilities across the US. Best Western and Comfort Inn are other budget chains that offer pet friendly properties, but call them first to ensure that your chosen location allows pets. Don’t leave your dog unattended in a hotel. Most hotel pet policies forbid this and even if they don’t, it’s not nice to your dog to leave them alone in a strange environment and it’s not nice to other guests, as anxious or lonely dogs often bark! Bring a clean blanket that you will use only to lay down on furniture that your dog may jump up on. Be considerate of the housekeeping staff and future guests and try to keep as much hair as possible off of furniture. Read the policies, some may forbid dogs from being on furniture at all, so be careful. One bed and breakfast we stayed at in Carmel, CA supplied a blanket that we could use, but we always bring one just in case they don’t. Ask the lodging staff where they recommend you take the dog for potty breaks. They may want you to avoid the well-manicured front lawn or garden (as appealing as that may look to you and Fido!) or they may have a dedicated dog walking area. And of course, be sure to clean up after your dog! Research a few dog-friendly restaurants before you leave, so you don’t arrive in a place, starving and have no idea where you can go to eat. Be sure to plan some dog-focused activities so your dog isn’t stuck in the car the whole time. Look for dog-friendly beaches, dog parks or hiking trails where dogs are allowed. US National Parks are difficult because dogs aren’t allowed on trails, but they can usually be walked (on leash) along internal park roads. Consider buying a pet travel guidebook. 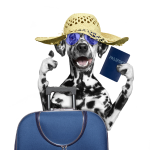 Just as guidebooks are helpful for when you have a last minute change of travel plans when on an international trip, a guidebook written for pet travel can help you. We own the book, The Dog Lover’s Companion to California and we keep it in the car so we always have advice on the nearest dog friendly hotels, restaurants, and activities. They make them for several other US geographies. Be sure to research doggie day care/pet sitting options in the area before you leave. Last December, we took Posey down to Cambria, CA primarily because we wanted to visit Hearst Castle. It was the middle of the winter, so we figured it would be cool and overcast and we would be able to leave her in the car while we visited the estate. The weather was beautiful and warm, too warm to leave her unattended in the car, so we didn’t get to see that attraction as planned. We went on a really beautiful hike instead, but I still lament not planning for this in advance! Several rolls of poo bags. A dedicated jug of water and several bowls. We try to bring at least 3 washed out, plastic cottage cheese containers: 2 to leave in the hotel room for food/water, and one to have in the car so we are always able to give our dog water. In a pinch you can use a plastic poo bag with the edges folded down (and you holding it) to give your dog a drink. Old towels to dry off your dog in case it may rain or if you are planning to take dog swimming. A dog crate or car harness to keep them safe in the back seat if you need to stop suddenly. If you are camping, a way to tie the dog up at the camp site.